What is Snap On (Hollywood) Smile. Snap-On Smiles are one of the fastest and most effective cosmetic dental procedures ever created. Patients can have a Hollywood smile without the Hollywood price. Best of all, it acts as a permanent solution while also being fully removable, making home care and maintenance a snap. • No injections, no drilling and no permanent cement are involved. • You can eat while wearing the Snap-On Smile appliance. 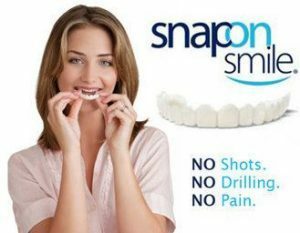 • Snap-On Smile is affordable and can last for years. • Can be worn while other existing dental restoration, such as ongoing implants treatments. In one visit to our surgery, Dr. Yousif will take a mould of your own teeth to ensure a perfect fit. Then after couple of weeks a Snap-On Smile using an advanced technology dental resin which will fits precisely over your existing teeth will be received from the specialised laboratory and will be delivered to you. After the quick and painless procedure, you will instantly have the most incredible and beautiful smile regardless of whether your teeth are chipped, crooked, broken or stained.